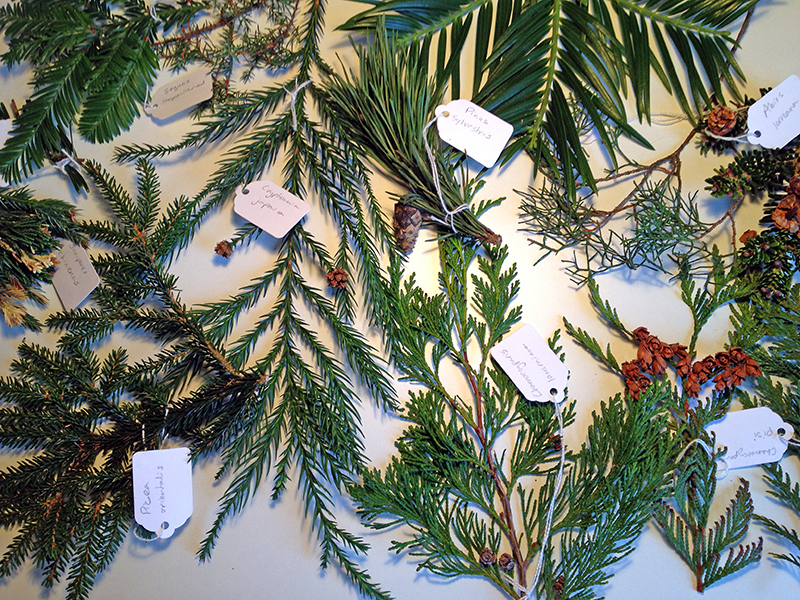 This week’s plant identification is a real challenge: conifers. We had a walkaround last Friday, just snuck it in as soon as the gardens reopened after having been closed most of the week because of high winds. It was still gusty, and a cold rain fell as we sped around the garden looking at twenty different conifers. My notes bled across the paper, which melted in the rain and sloughed away under my pen. The weather and similarity of the subject matter conspired against me, and over the weekend I found I wasn’t able to learn the conifers as fast as I had other plants. So Tuesday night, after a full day of work experience at the Botanics, I set out alone to find the twenty trees we’d been assigned to learn. The gardens had closed for the day, the gates locked, and I was alone with the plants. It was a real scavenger hunt as I tried to remember where we’d walked in a garden I have still not learned by heart. The day was going dark fast, and snow fell as I tromped beneath evergreen boughs, trying to spot the small black labels that identify each plant in the garden. The only sound was the strange and reproachful flapping of the large roosting birds whose bedtime I’d disturbed. It was so cold that my hands cramped and I could write only shaky initials on the labels I’d brought to i.d. cuttings from each of the assigned trees. In the empty garden, in the freezing dark, I caught a tiny glimpse of the wildness that makes urban gardens such important links to the natural world. 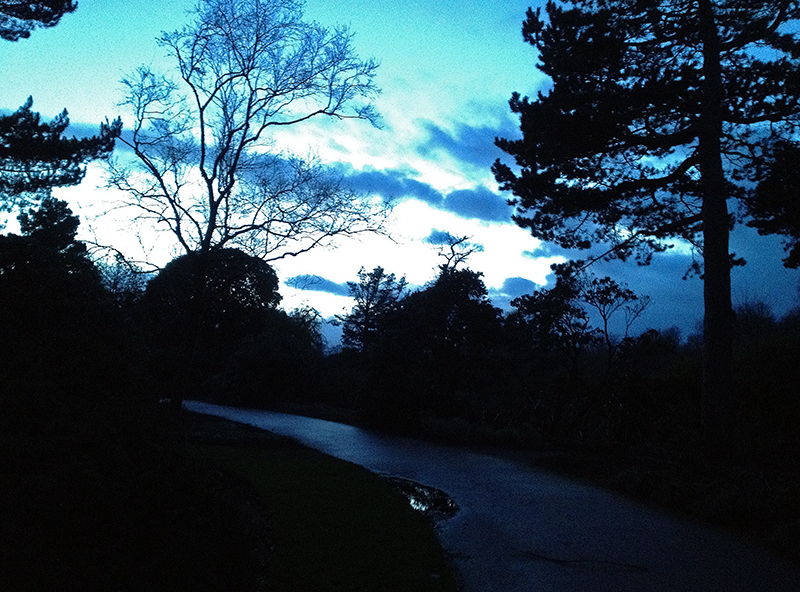 By day the Botanics are obsessively orderly and man’s desire to control nature is the main attraction. But when all the people leave, and the darkness erases tidy edges and labeling plaques, the garden occupants revert to their undomesticated outlines. Walking amongst them, in the quiet dark, the city dropped from my awareness and I was for just a moment back in all the wild places I have lived in and loved, and miss. 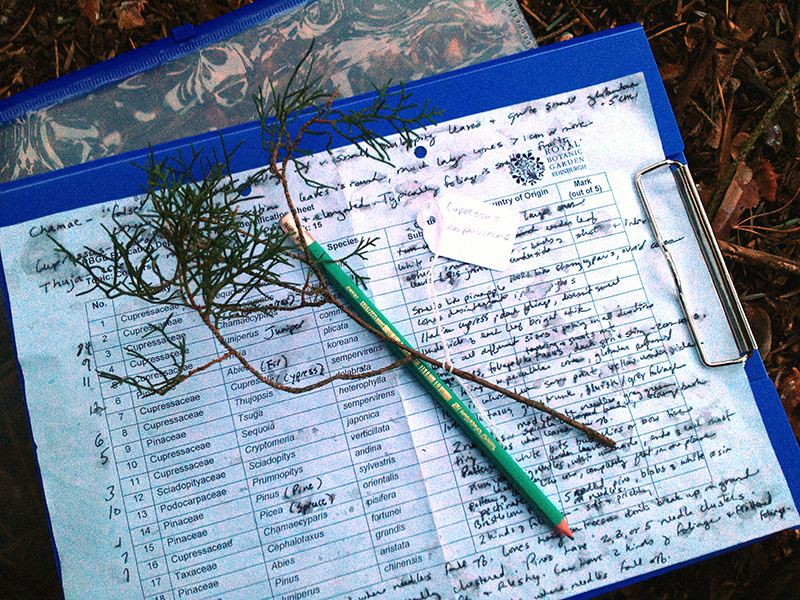 All week I’ve been working with the plant material I collected that night, learning these conifers not only by sight (Chamaecyparis pisifera has white, butterfly-shaped markings on the underside of its leaves) but also by touch and smell (Thuja plicata smells like pineapple or artificial fruit flavoring). To have such closely related plant material has been an exercise in broadening my identification skills to include all senses. The test is tomorrow, wish me luck. Thanks, Tara! That’s a great tip! You are currently reading Studying at Bonafide Farm.